New York, NY, November 13, 2017 –(PR.com)– Today, Pro Business Plans, a custom business plan writing company specializing in helping entrepreneurs raise capital, announced they have released a free one page DIY business plan and executive summary software, available for use at (template.business-plans.com). After working with over 10,000 startup companies and investors worldwide, they sought to create a seamless software that guides companies through to creating a simple yet powerful executive summary designed to address all investor questions. Unlike other software on the market that charges a fee, this was created by finance professionals and provides helpful tips throughout the creation process that helps entrepreneurs better understand what investors will ask and how to present information in the most effective manner. Upon completion, users receive a downloadable .PDF file immediately. · The marketing problem and their startup’s unique approach to solving it. · The management team and key achievements of the company so far. 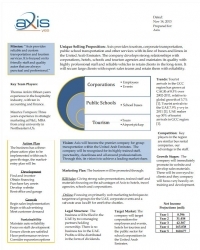 · The marketing strategy and goals for accelerating business growth. · Financial projections and use of funds.